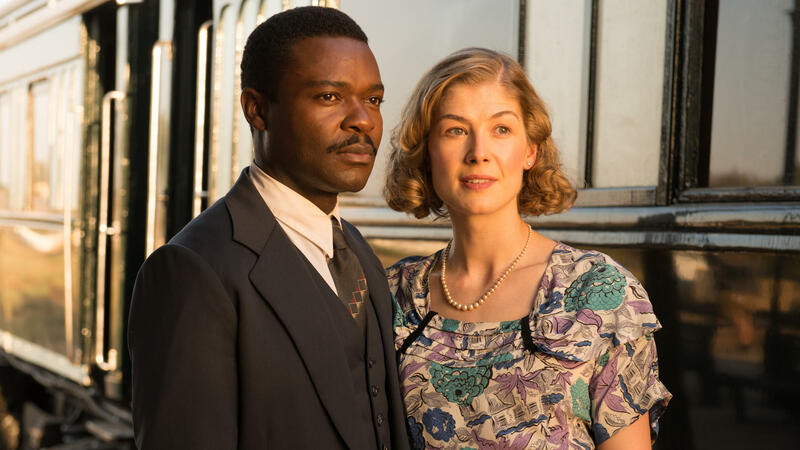 David Oyelowo and Rosamund Pike play real-life couple Seretse and Ruth Khama in A United Kingdom. 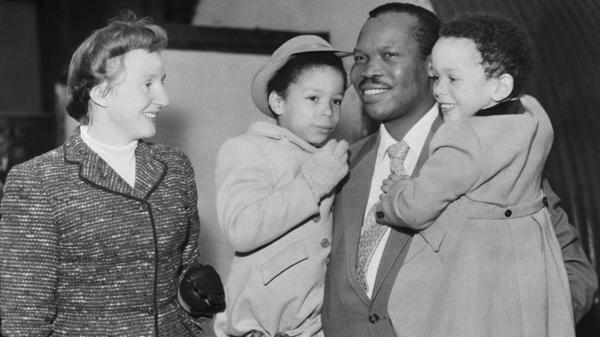 After his marriage, the real Seretse Khama spent years in exile. He's shown here in 1956 with his wife, Ruth, and two of their children. Their marriage angered nearby countries that were part of the British empire, including South Africa, which had just banned mixed marriage and was establishing apartheid. As a result, Khama, played by David Oyelowo, was forced to defend his marriage both internationally and at home. One scene shows him doing just that in front of a tribal council. "We should be fighting for equality," he says. "That is where we should be focusing our minds, not on the wife I have chosen, who means you no harm, whose only apparent crime has been to fall in love with me — and mine to fall in love in with her. I cannot serve you without her by my side, but I cannot force you to accept this." Oyelowo spoke with NPR's Audie Cornish. The wonderful thing about Ruth Williams and Seretse Khama is even though they were from different countries, different cultures, even though they were living in a time period where there was very real and apparent opposition to a black man and a white woman being together, they fell in love with each other's soul[s]; they fell in love with each other's intellect; they fell in love with each other's love of jazz. They managed somehow to cut across and past the racial divide and it was almost as if, once they had fallen in love and were reemerging from that haze, that suddenly the reality of what they had allowed themselves to feel made itself known in the shape not only of familial opposition — both from Ruth's family and Seretse's family — but governmentally. Bechuanaland, as Botswana was called back then, was a protectorate of the United Kingdom, and so therefore Great Britain had a say in what was happening in Bechuanaland. South Africa was in the midst of instituting apartheid. But also, Great Britain was beholden to South Africa because it needed South Africa's uranium to fight the Cold War; it needed South Africa's gold because the coffers were highly depleted after the second world war in the U.K. And South Africa was threatening to leave the commonwealth. So these two people getting married just across the border in Bechuanaland ... was something South Africa was just not going to allow, and South Africa had a lot of leverage. The people of Bechuanaland ... had been subjected to apartheid-like behavior in their country. ... And here was their prince, who had been sent away to be educated, coming back with a white person who, in people in Bechuanaland's mind, was synonymous with intolerance and prejudice. And now you're proposing that this person is going to be our queen? So, you know, some of the opposition was very understandable, some of it was purely about the disgust at the thought of this black man and this white woman in bed together. Both men had that attribute that I personally admire the most in human beings, which is an enormous capacity to love. And not just love in a thin, romantic Hollywood way — I'm talking about sacrificial love where you are prepared to put yourself on the line for others. And in the case of Dr. King, obviously, that was for a people; but with Seretse Khama, it was for both his wife and his people. And, you know, that's a real point of overlap that I could feel in my body playing both characters. I can't lie to you and say I'm buried under an avalanche of scripts. And the reason I say that is, look, the breadth of what you hope will be coming your way isn't necessarily there. So, you know, I'm not going to complain about it, I'm not going to grow bitter in a corner. I just have to develop things that I want to see myself do. But having said that, you know, I asked Tom Cruise how he had managed to remain a movie star for over 30 years and he said to me, "David, create create create. After my very first movie, every film I've done I had a hand in bringing to fruition." Now, that's Tom Cruise. So if that's the rule for him, it can be the rule for me. A young woman meets a prince and falls in love - sounds like the start of an old-fashioned fairy tale, right? Well, in the movie "A United Kingdom," it's the start of a diplomatic firestorm. JACK DAVENPORT: (As Alistair Canning) If you choose to marry the leader of an African nation, you will be responsible for the downfall of the British Empire in Africa. NICHOLAS LYNDHURST: (As George Williams) Do you choose a life of insults and shame? ROSAMUND PIKE: (As Ruth Williams) I know what you're asking, what it means. And, yes, I will marry you (crying). CORNISH: "A United Kingdom" tells the story of Ruth Williams and Seretse Khama beginning in the late 1940s. Williams is a London typist. Khama is heir to the throne of Bechuanaland, modern day Botswana. Now, their marriage angered nearby countries that were part of the British Empire, including South Africa. David Oyelowo, best known for playing another freedom fighter, Dr. Martin Luther King in 2014's "Selma," sat down with us to talk about playing Khama and how a marriage could upset the British Empire. DAVID OYELOWO: They fell in love with each other's soul. They fell in love with each other's intellect. They fell in with each other's love of jazz. And it was almost as if once they had fallen in love and were re-emerging from that haze, that suddenly the reality made itself known in the shape not only of familial opposition. But governmentally, Bechuanaland, as Botswana was called back then, was a protectorate of the United Kingdom. And so, therefore, Great Britain had a say in what was happening in Bechuanaland. But South Africa was in the midst of instituting apartheid, and South Africa had a lot of leverage in persuading Great Britain to annul this marriage. CORNISH: Right, in this moment, they are literally codifying this way of life. And so right over the border, they can't have a white African Queen. OYELOWO: Absolutely not. And that was the point. It was how high-profile of a marriage it was going to be. But putting that aside for one second, I mean, you know, let's pay a moment's thought for the people of Bechuanaland who had been subjected to apartheid-like behavior in their country not least because South Africa was over the border. And here was their prince who had been sent away to be educated coming back with a white person who in people in Bechuanaland's mind was synonymous with intolerance and prejudice. And now you're proposing that this person's going to be our queen. So you know, some of the opposition was very understandable. Some of it was purely about the disgust at the thought of this black man and this white woman in bed together. CORNISH: The movie's reply to all this comes in this big speech that Khama has to make before tribal council where he's trying to convince them that he should still be king and makes his argument. OYELOWO: (As Seretse Khama) We should be fighting for equality. That is where we should be focusing our minds, not on the wife I have chosen who means you no harm, whose only apparent crime has been to fall in love with me and mine to fall in love with her. CORNISH: This scene also reminds me of scenes from the movie "Selma" where you played Dr. Martin Luther King Jr. I've read that you stayed in character during that. You did a lot of research for that film in embodying that person. What did these men have in common to your mind? OYELOWO: ...When you are prepared to put yourself on the line for others. And in the case of Dr. King, obviously that was for a people. But with Seretse Khama, it was for both his wife and his people. And, you know, that's a real point of overlap that I could feel in my body playing both characters. CORNISH: You know, your portrayal of King back in 2014 was a performance that people thought should have been recognized by the Academy Awards. And that year, of course, like, no people of color (laughter) were recognize, really, for very much by the Academy. And you were among those to say the Academy has a problem. And since then, the activism around this social media campaign Oscars So White - it's kind of - it's kept going. And I was wondering if you feel like that conversation began any meaningful change? CORNISH: Right, it would have been like, job well done (laughter). OYELOWO: It would have been, well, we allowed one in. OYELOWO: What are you complaining about? And the big shift I have seen is not necessarily that infrastructurally things have changed enough to - for us to really pat ourselves on the back about change, but I feel like there is a holding to account of my industry and the captains of my industry in a way that there wasn't before. I think the audience is far more attuned to not only when people are not being recognized but also when there are certain stories being whitewashed. CORNISH: You know, after doing such big characters, what's next for you? What are you looking for? CORNISH: You're, like, giving them to your kids at this point, right? CORNISH: You're just like, go to bed - yeah. CORNISH: Please tell me you're getting scripts because I hate when (laughter) actors of color reach a certain point and they're like, things are still not great. CORNISH: I'm still not getting anything, and I have to produce everything myself. That, as person of color, is always a little bit sad to hear. CORNISH: No, lie to me. OYELOWO: Well, but - and the reason I say that is - look; the breadth of what you hope will be coming your way isn't necessarily there. So, you know, I'm not going to complain about it. I'm not going to grow bitter in a corner. I just have to develop things that I want to see myself do. But having said that, you know, I asked Tom Cruise how he had managed to remain a movie star for 30 years, over 30 years. And he said to me, David, create, create, create. After my very first movie, every film I've done I had a hand in bringing to fruition. Now, that's Tom Cruise, so if that's the rule for him, it can be the rule for me. CORNISH: That makes me feel better. OYELOWO: Good, good. I don't want you being upset. CORNISH: (Laughter) It's really about me. Yeah, sorry about that, OK. David Oyelowo is producer and the star of the new film "A United Kingdom." It's out now. 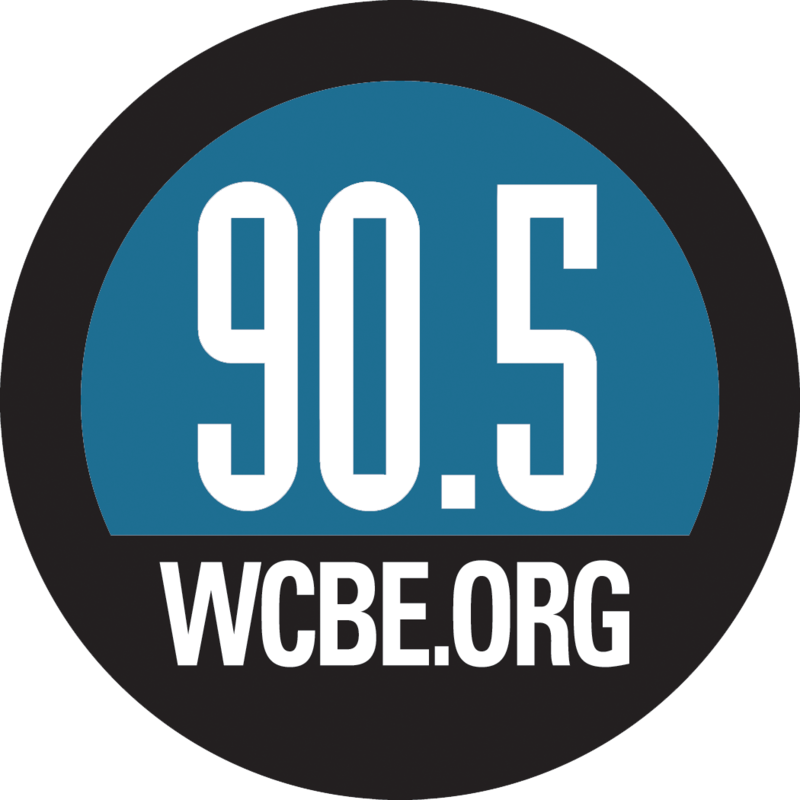 Thank you so much for speaking with us. OYELOWO: Pleasure, thank you. Transcript provided by NPR, Copyright NPR.